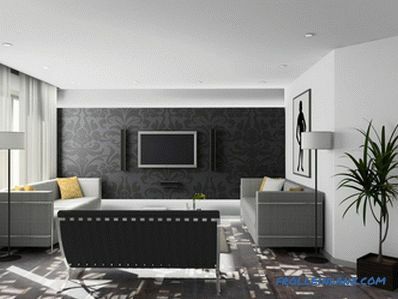 When decorating my apartment or house, I want to do everything with taste, using practical and beautiful modern materials. 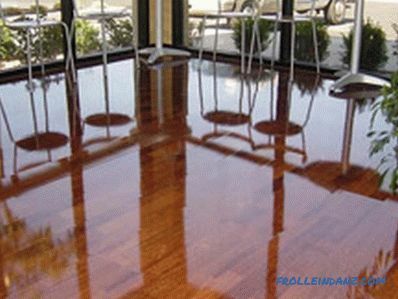 When it comes to the floor, most often refer to the laminated coatings, a variety of which never ceases to amaze. 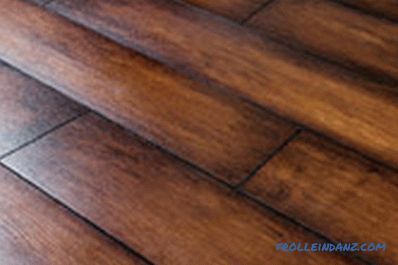 In this review, we look at what types of laminate are in design, surface, locks and wear resistance class. Artists show a lot of fiction by creating new types of design for this material. It is covered with original patterns and drawings, changing the texture of the surface, making it either rough, sometimes matte, or brilliantly glossy. I began to imitate a living and warm wooden surface a long time ago. 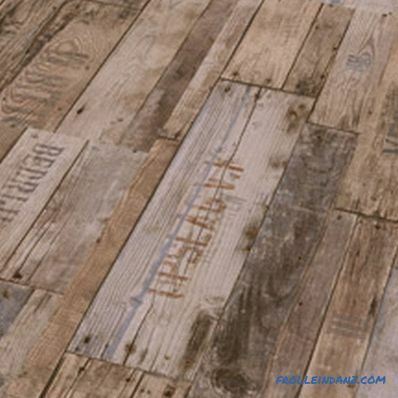 In principle, the laminate was created as a budget variation of expensive floorboard. It turned out well, and laminated boards, very similar to oak, birch or maple, look no worse than parquet. 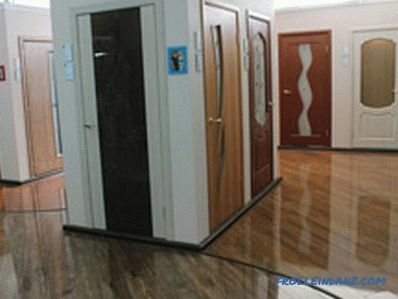 Even the characteristic pattern of various types of wood is transmitted very accurately. Examples in the photo below. 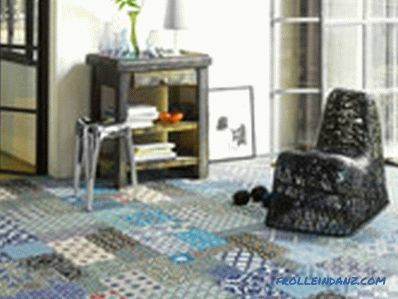 Many lovers of refined and unusual interiors will like the floor of an office room or a crocodile-decorated living room . And if you also finish the walls with this material, then you get something quite unusual. 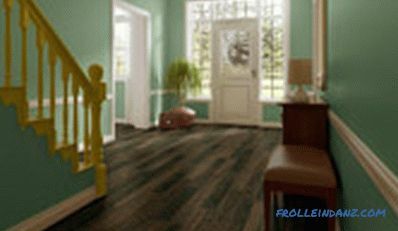 Collections in a similar style are produced by German firms Classen and Proteco. However, this is a premium class, and the cost of products is far from budget. 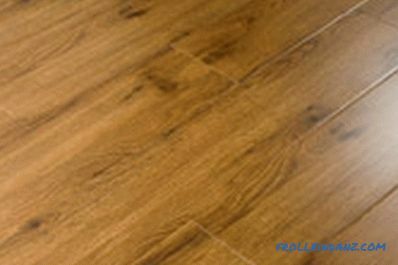 However, “leather” laminate can be bought at a more affordable price. 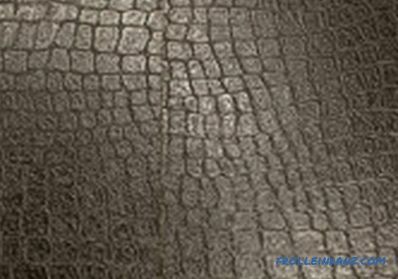 Russian manufacturer Ritter offers practical, durable and inexpensive coatings that imitate the skin of not only the crocodile, but also various reptiles. They look elegant and stylish, see the photo below. This design direction, like high-tech, involves numerous glass and metal parts. 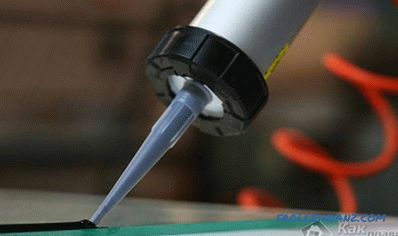 In this case it will be very appropriate laminated coating under the metal. For example, from the Design Cargo Metal collection from the German brand Kronotex. 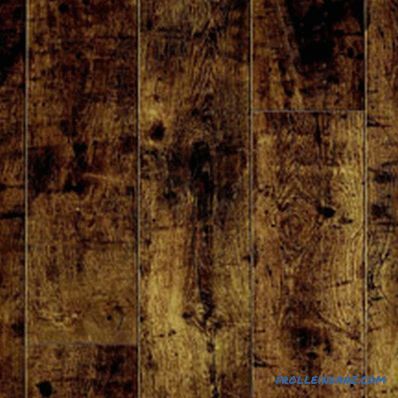 A similar floor will look great in a teenager's room or in a kitchen with an abundance of stainless steel items, a modernly furnished living room, a nightclub or a shopping center. 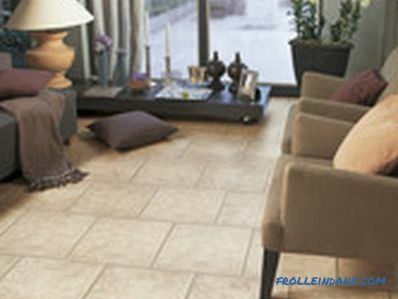 Stone floors give a feeling of reliability and durability. But they are cold, which is not very comfortable for bare feet. 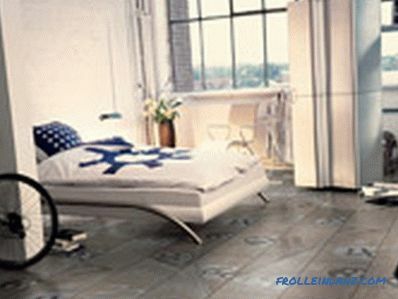 In addition, the purchase and installation of porcelain tiles costly very expensive. 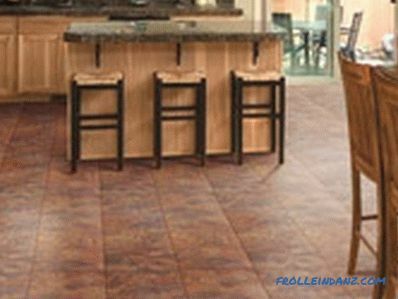 Laminate manufacturers thought and decided to correct this shortcoming. 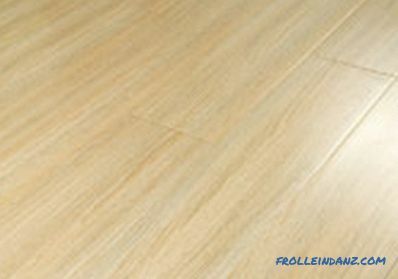 They released a warm and pleasant to the touch material, perfectly copying the appearance of the stone. Almost all well-known brands have "stone" collections. 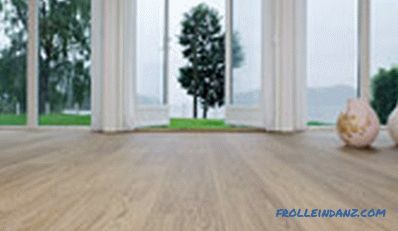 As examples we will call the companies Parador, Alloc, Kronotex, Egger, Quickstep, Witex. 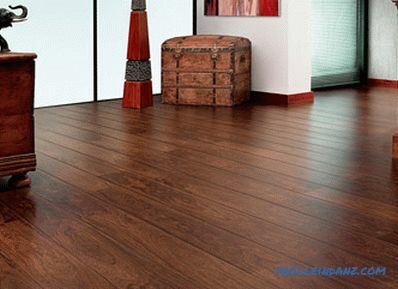 Similar flooring can be laid in the hallway, kitchen or bathroom. 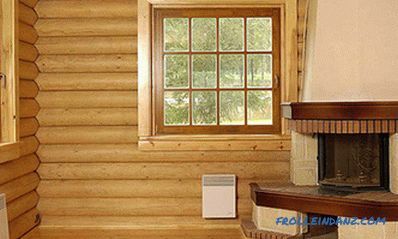 They are well combined with furnishings, where there is a stone decoration, as well as with fireplace rooms. 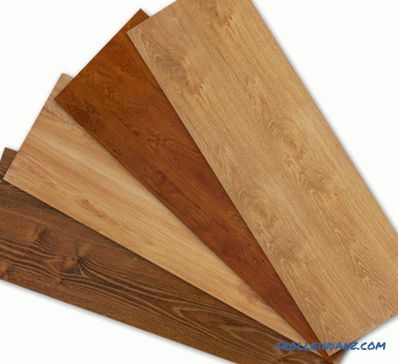 Below are photos of various types of laminate with such a surface. Collections, called designer, distinguish a whirlwind of colors and unpredictability of lines. 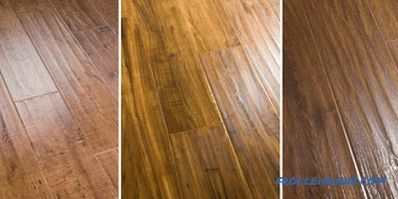 Their patterns and textures are exclusive, not one type of laminate is like the other. So, the company Kronotex offers to go on a trip around the city or around the globe, buying products that have maps. For the style of pop art is very good. 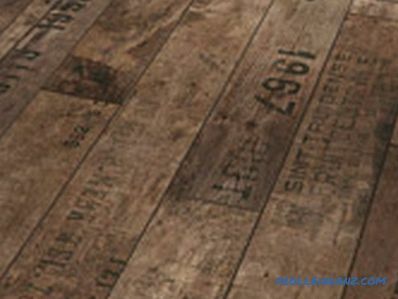 It would be desirable home comfort - buy an unusual laminate from the same brand, similar to burlap or canvas fabric. 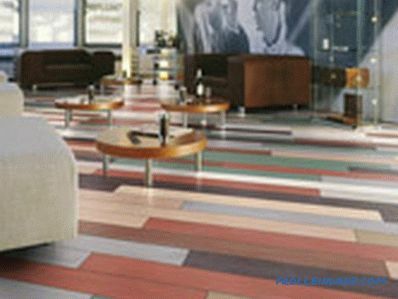 Parador from Germany with its TrendTime and Edition collections amazes buyers. 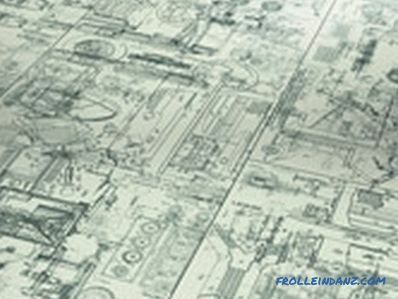 What is there is no - drawings of Leonardo da Vinci, animal skins, ancient rock paintings, abstract drawings of acid colors. A more modest, but very original collection of Total Dezign from Pergo will surprise you with handprints and bar codes. Do not forget the manufacturers and about the kids. Chronotex made them products with funny and funny drawings (for example, "Pink Bambino"). 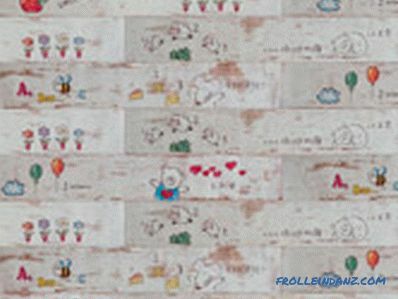 Classen company is a collection of Joy Kids, from which you can select products with Kitty, so loved by little girls. Austrian brand Kaindl has released a Soft Touch collection. 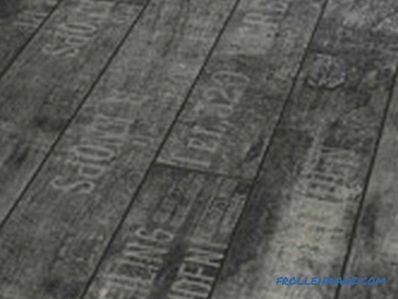 Looks great floor in the game room or in the home of a teenager, decorated with original stamps and drawings, scorched wood. 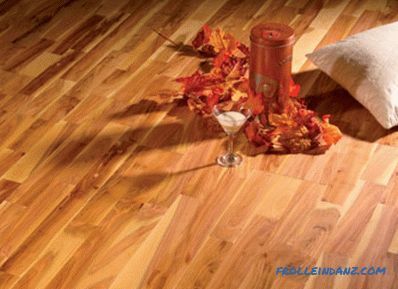 Considering the types and properties laminate, do not forget to talk about the texture of its upper layer. 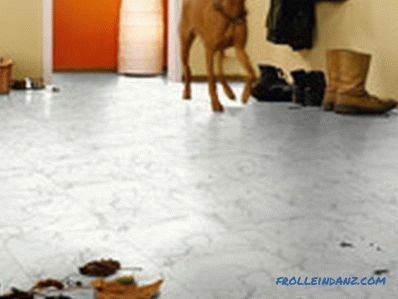 After all, the appearance of the flooring depends on it. This laminate feels smooth to the touch. 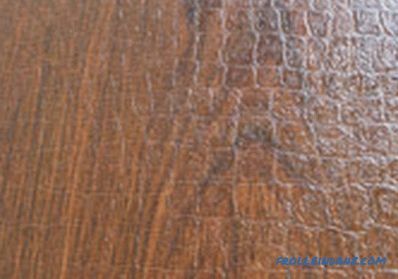 But in order to make the coating boards look more natural and natural, slightly visible lines and pits are made on the upper layer. They depict the pores of wood, and it is quite possible to see them without a magnifying glass. Wooden products that have been on the street for a long time inevitably grow old. Their surface takes on a different appearance from the new tree. 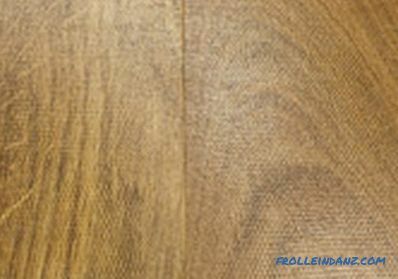 To make the laminated coating look like aged wood, noticeable smoothed bumps are created on it. 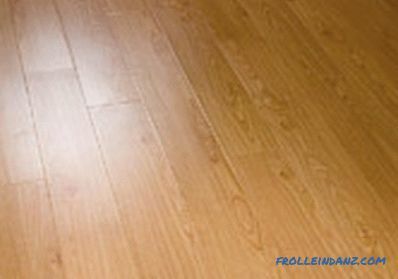 The shiny laminate floor looks great in the kitchen, giving it a shine of cleanliness. 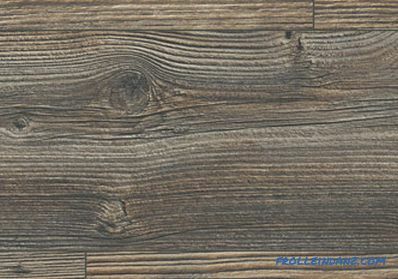 Such a laminate resembles wooden boards, generously varnished. 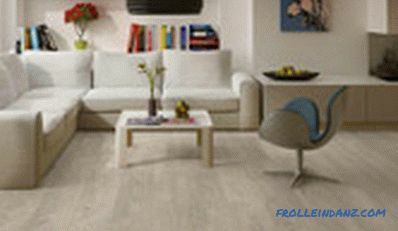 Wood fibers that appear on the surface give the impression that we are in front of a truly natural material. Poorly appearing relief (like a collection called Egger's Emotion) allows you to achieve this effect. 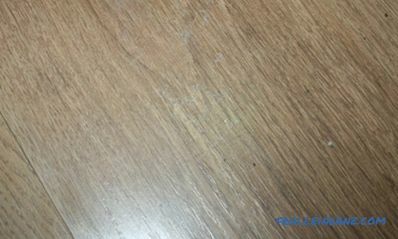 Thin dit-grooves along the entire length of the laminated board (usually with a chamfer) are not intended to copy drawing wood structure. They only mimic the roughness of the tree. 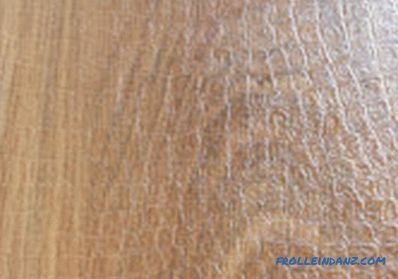 For a wooden product, slightly varnished (in one or two thin layers, not more), all the pores and patterns typical of this breed. 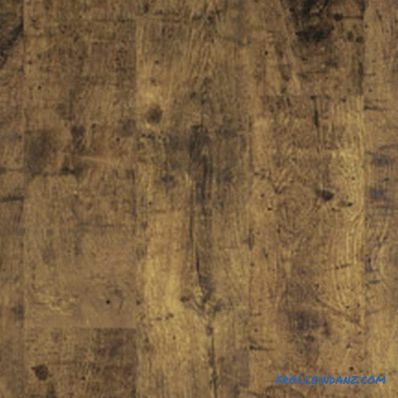 This is exactly what a laminate with a natural surface looks like. 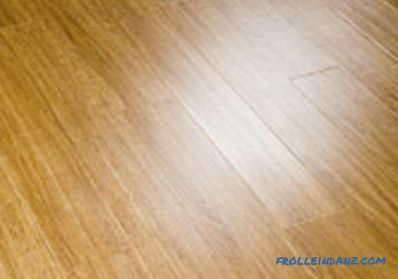 This laminate is matt, it is not visible on it, its boards are absolutely smooth and even throughout length. In appearance, it looks like a tree that is well prolyphily. And if the tree is to be waxed, it will have an internal warm shine, slightly noticeable, but so cozy and lively . Laminates of this type are often made to look like a massive board. Rustic style is very good in a country cottage. This coating is like wooden boards, slightly touched by a plane. The surface is obtained with a large relief, slightly smoothed. 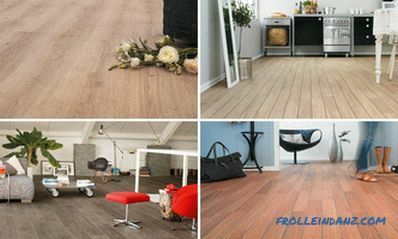 Most laminated coatings come in the form of long (1.2 to 2 meters) ) boards. This is convenient when you need to lay the floor in a large room. It turns out quickly, but with convenient locks also simple. 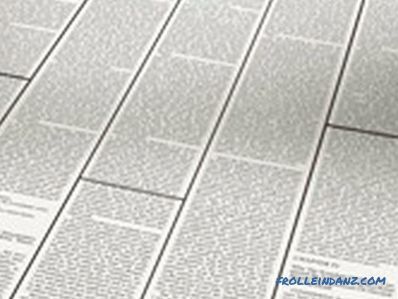 In order to create more complex patterns, many manufacturers began to make laminate in the form of square tiles. He stands the track than the previous type, but does not require a substrate. 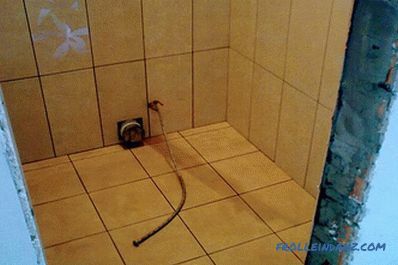 Yes, and put it more convenient, but in terms of repair with tiles more difficult. 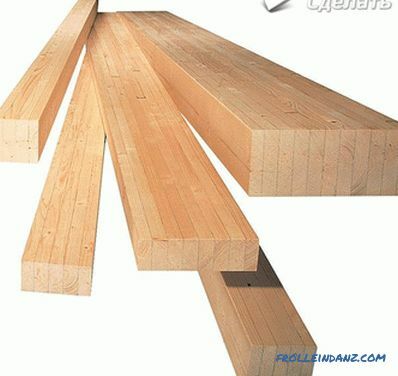 At the very beginning, laminated boards were necessarily bonded to each other with glue. Then they came up with a more convenient and original castle method, and many now prefer to use it. Here the boards are fastened by one of two types of laminate locks - which one is better, we will now find out. This type of lock was invented first. At one long end of the board, a figure ledge is made, and at the opposite end, a notch of the corresponding shape. 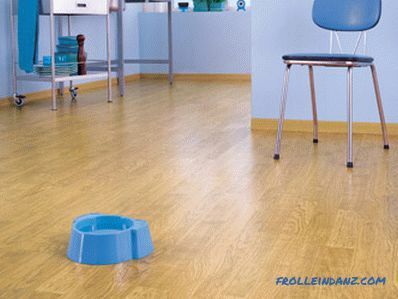 When installing the flooring, these elements are connected to each other, and for reliability, they are tapped on top with a hammer-mallet with a rubber or wooden tip. In addition, there are combs on the ledge that do not allow the lock to disperse. 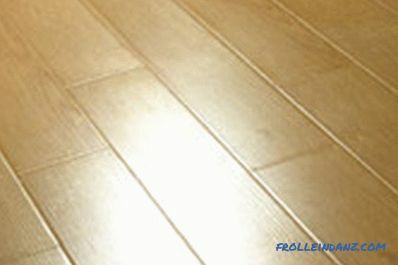 Laminate, connected in this way, is cheaper. 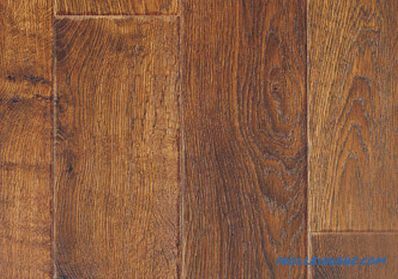 To create a high-quality surface, the flooring should be done by an experienced craftsman. If this is done by a person who is not familiar with the laminate, the result can be deplorable. 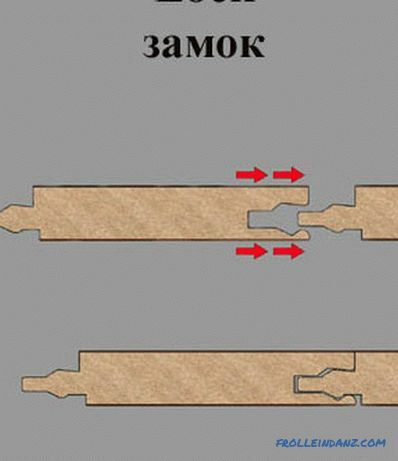 With a large load, the locks will not last for a long time, because the friction force will constantly act on them. Parts, wearing and wearing out, eventually break. The result - ugly slots on the floor. If the base is not sufficiently level, then the lock lock will also quickly fail. A more modern type of connection has been recognized not only by professional builders , but also at home craftsmen. After all, click-locks are so simply latched that anyone can handle them. And no experience is needed. Putting the boards to each other at an angle of about forty-five degrees, just enough to press the lock. Silent click - and everything is ready, without any clicking. We note several other advantages of this type of lock. So, being subjected to loads, they are not only not loosened, but, on the contrary, strengthened. Indeed, in this case, the force of compression acts on the structure. 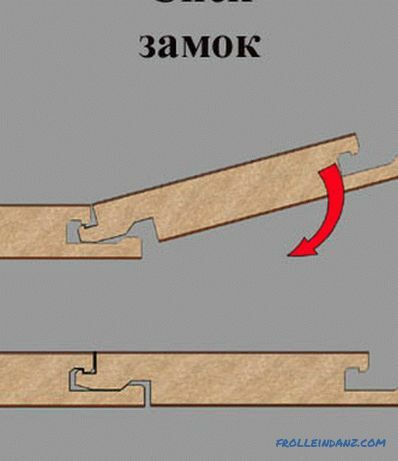 In addition, the connection, as a constructor, is collapsible. 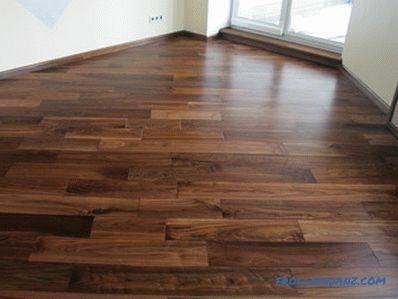 Another plus is that when moving to a new apartment, you can take a floor with you. The downside is the higher cost. 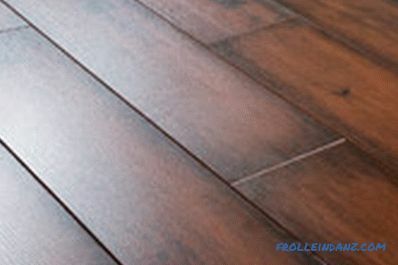 Laminate types according to wear resistance classes and loads wear resistance. To do this, we look at the class of the product - it is from 21 to 34. The last figure indicates the load the material can take on. With its increase, this quality improves. We learn about wear resistance by the first digit. 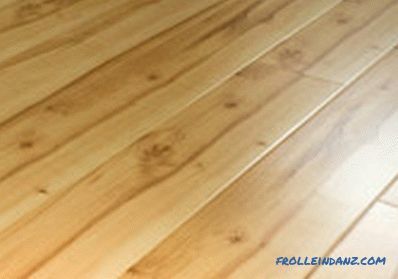 If it is a two, then we face household laminate, which, by the way, is no longer produced in our country. It is suitable only for home conditions. Class 21 - there can be only where no one walks (under the bed in the bedroom or in the pantry). And still more than two years will not stand. Class 22 - will live under the same conditions twice as long. Class 23 - can serve from four to six years. 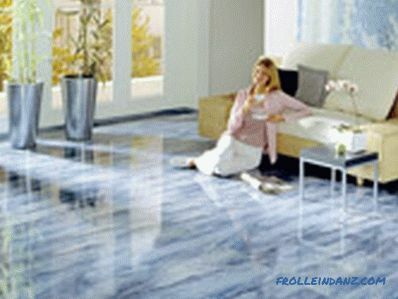 Previously, this laminate even in living rooms, kitchens and corridors were laid. Not now. The three at the beginning of the marking means that the material is of an office (or commercial) type. In the apartment he will live twice or four times as long. Class 31 - least resistant to loads . In the office, his life will be limited to two or three years, but at home he will lie for ten years. Class 32 - able to withstand the legs of office workers for three to five years. In the apartment - up to fifteen years. Class 33 is even more resistant to the shuffling of the soles. In the office, he doesn’t make up in five or six years, at home in fifteen or twenty years. Class 34 - the so-called "sports" coating. It calmly stands a day for a thousand people. Great for sports complexes, shopping centers and office buildings. Well, in the house he can lie forever.